Colour Inkspiration is a Facebook challenge that gives us a lovely colour palette to play fortnightly. 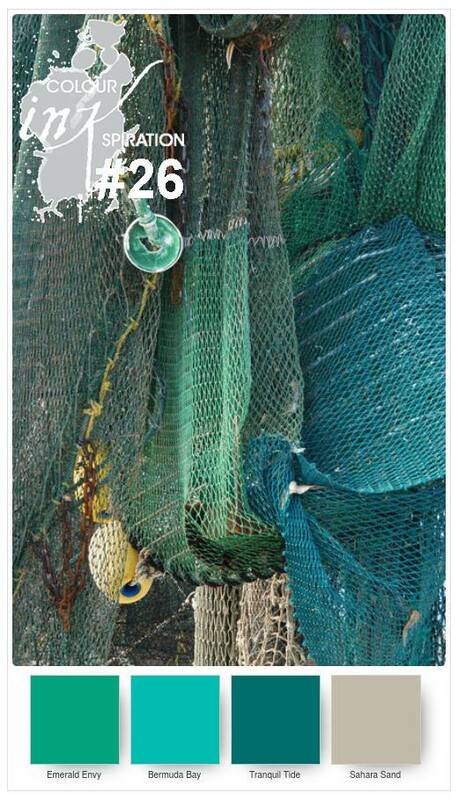 The colours and gorgeous graphic just screamed the seaside, so I got out Seaside Shore. It's been a bit neglected of late but it is a set I love. The masked column uses all four colours. The shells/starfish are stamped in Sahara Sand and clear embossed. The seaweed was stamped in Tranquil Tide and clear embossed then I water-coloured the interior. 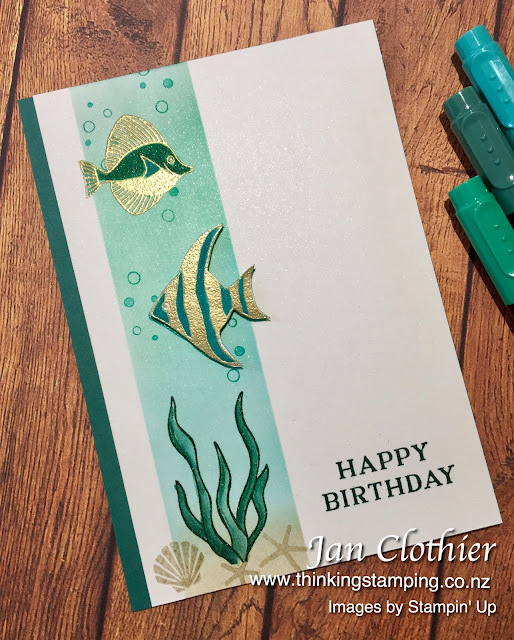 The fish are gold embossed and coloured with Stampin' Write markers. One is directly embossed onto the column and the other fussy cut so it could be popped up on dimensionals to give some depth. This inside sentiment is from Seaside Shore. Update: Delighted to make the Top 5 at Colour Inkspiration! 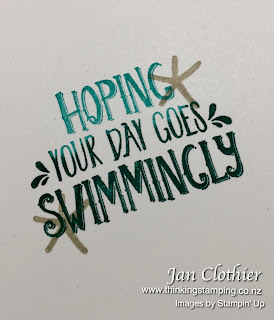 Inks: Sahara Sand, Bermuda Bay, Emerald Envy, Tranquil Tide, versamark. Wow! This is stunning, Jan! 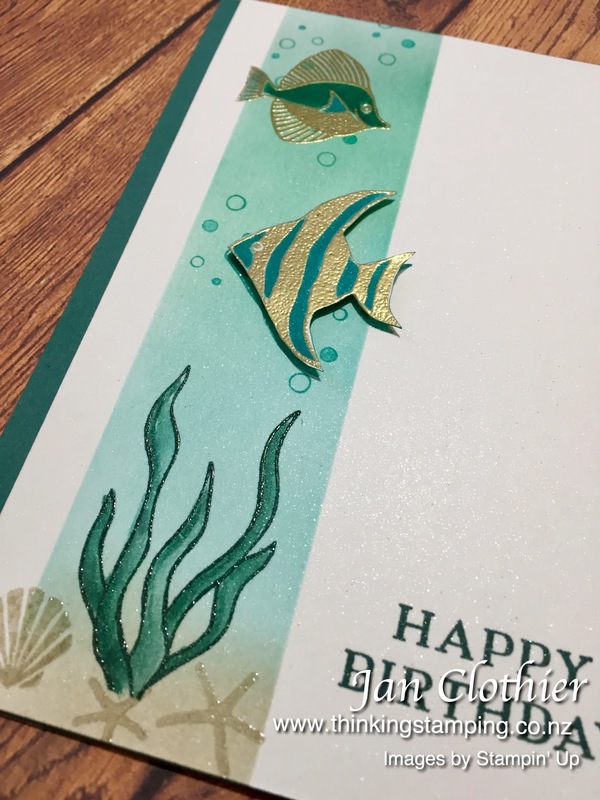 Those colours are so rich, especially with the gold embossing added! I love the depth you've created! Beautiful! This is just lovely! A refreshing scene to cool you off, right?! LOVE those colors... I need to go check out that FB page! Beautiful card!!! Gold embossing the fish was genius!! Oh my this card design and colour choices is certainly exquisite.